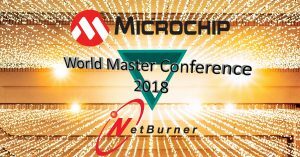 NetBurner is proud to offer two in-depth classes at the MICROCHIP® 22nd Annual Worldwide MASTERS Conference. Better yet, this hands-on workshop utilizes our latest ARM-Powered Ethernet System-on-Module! We will use our products to dive into the ins and outs of debugging networking issues from the field. This is an event with lots to offer and one to not miss! This developer event features highly technical, in-depth sessions focused on building web and network applications.